If I knew how much thought, labor, creativity, and effort would have had to go into making Coffee Cycle........ well, yeah, I still would do it, it's awesome! But I certainly would've been more prepared for how much time it has been taking. Now that we've got something really solid and tangible, it's nice to look at it and realize that our efforts have paid off already, and are only going to get more exciting and rewarding. 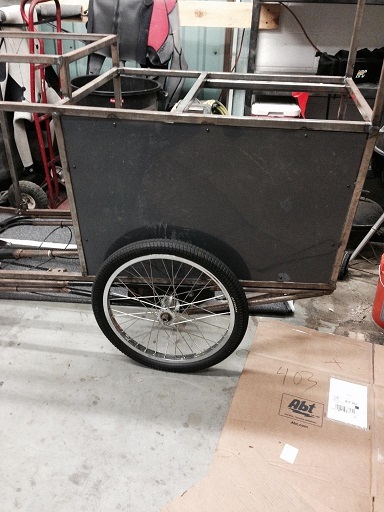 A couple weeks ago, Stu at Anywhere Bicycle Repair let me know the mobile tricycle platform was ready. Months ago he finished running the hydraulic disc brake lines for front and rear, he built wheels with crazy extra thick motorcycle spokes, and he installed a comfortable cockpit (bars, grips, pedals, seat) for long rides on the Coffee Cycle. After being on a wait list at High Power Cycles (who we turned to after Lectric Cycles in Arizona stopped answering/returning phone calls/emails), we finally received our 750W Mid Drive Bafang 8fun motor, complete with a real heavy duty 52V Lithium battery. This electric motor system is the ultimate in high torque/low top speed electric power assist, being able to use all the gears on a normal bicycle drive train to make the motor work at an ideal effort level. 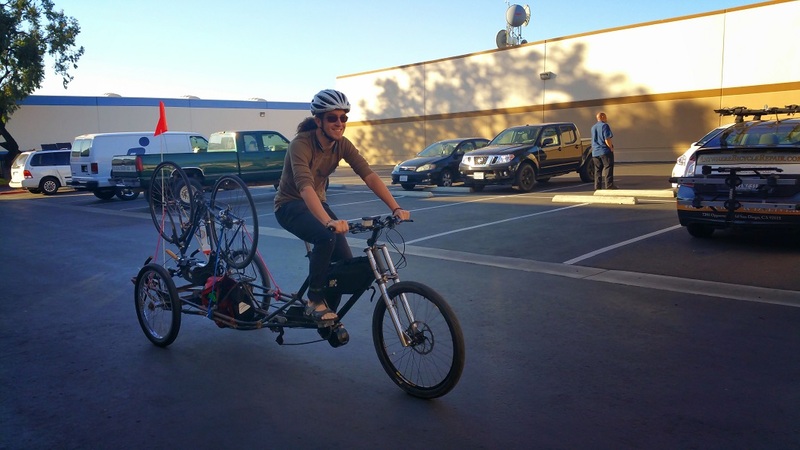 So, after installing the motor and figuring out a few kinks that came to light after installation, I rode my bicycle up to ABR in Kearny Mesa to pick up the mobile tricycle platform. Stu and I strapped my bike to the back of the trike, then I started riding down to Peter's fabrication shop down close to Old Town. It took about 45 minutes, and was a blast to ride. So far, the engineering of the vehicle met and/or exceeded all my expectations. 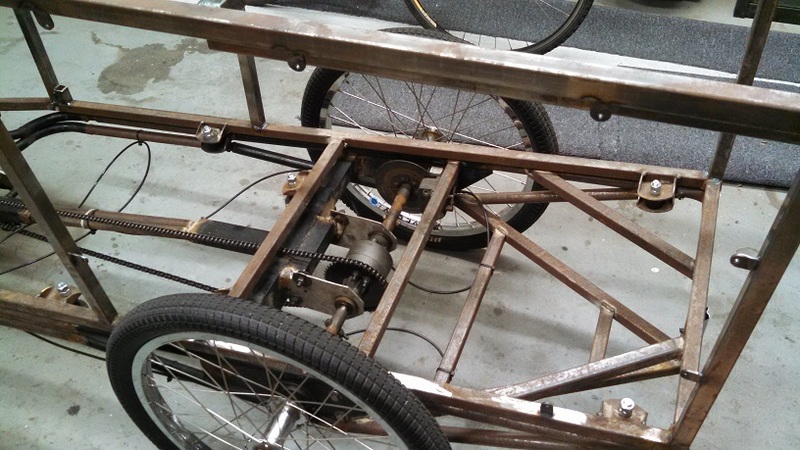 Once we got the tricycle platform down to Peter's, we knew it was time to finish finalizing the welding on the coffee cart framework. 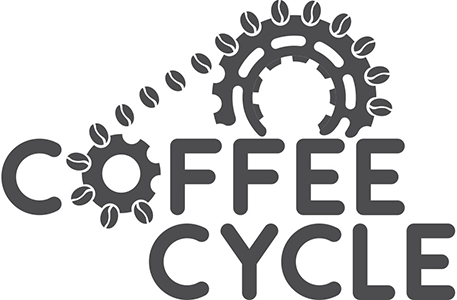 A lot of projects had been moving in and out of Peter's shop, so it was about time to put some serious focus on the Coffee Cycle and make things happen. Once some space cleared up in the shop, it didn't take Peter long. Before I knew it, he not only had the welds finalized, but he had welded on the mounting tabs for one of the side panels. The next day I cruised by the shop on a fun Tuesday bike ride with Stu, and Peter had already cut the first panel and had it mounted in the frame. It looked great - and it's not even painted yet! Because the two major pieces of framework were complete, it was only right that we test out our new creation's capabilities. 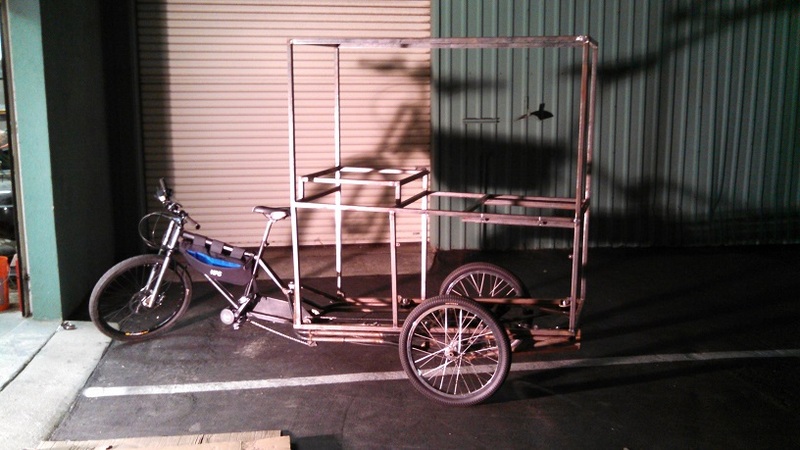 We mounted the coffee cart frame to the mobile tricycle platform, then simulated the payload of a fully loaded coffee cart by having a few of us ride inside the new framework on the back. 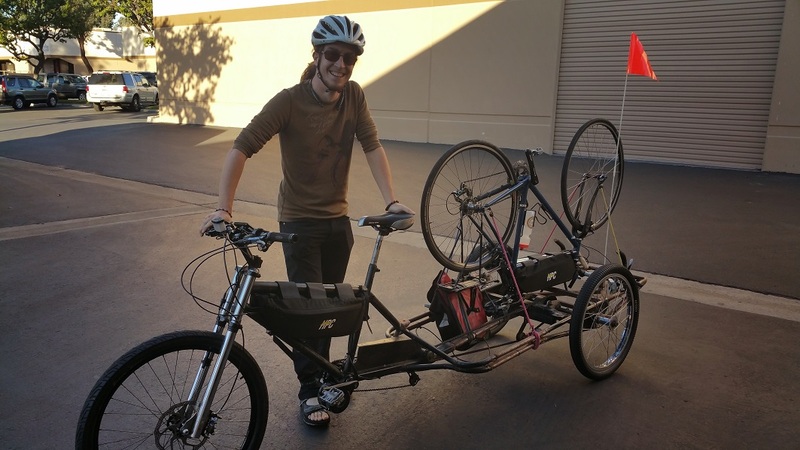 Our friend Joey got on and started pedaling, and the whole contraption definitely worked! There's a lot left to do, but some huge milestones have now been passed and I can definitely say this is getting exciting!